Stephen Lewins has delivered some more great images and info on another OB in Northumberland. The Paxtondene OB can be seen here. Today we have added about 250 new links on our Operational Bases page. Whilst this information has have been in the public domain for sometime the web links to them have not been easy to find. We now cover most of the UK. 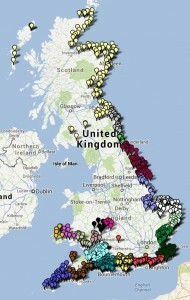 If you fancy trying to find an OB from the list that is near you please feel free and take some pictures for our site. Remember though most sites are on private land. If we have missed anything or got it wrong please let us know.